Sandy Bunch Vanderpol asked if I could provide any additional advice based on my years as an official. Here are a few additional thoughts on retirement savings specifically for officials. One word: benefits. As a court employee for more than 38 years, I have employee health insurance and retirement benefits available to me. This is one of the many reasons I have chosen the path of court employee over freelance self-employment. Understand how your retirement plan works. When we’re employees, it is important that we understand what benefits are available. Understanding them is the first step to taking full advantage of the benefits. I sought out professional financial counseling to develop strategies for a successful retirement. Federal and state government employees are covered by different retirement systems depending on when you were hired and where you work. You may or may not have had Social Security taxes deducted from your paycheck. Whether Social Security benefits are going to be available to you in retirement is a very important point to know, so you can plan accordingly. Determine what formula your employer uses to calculate retirement benefits. Find out if the formula for calculation is years of service credit, age at retirement and final compensation, or some other formula. Calculate the estimated benefit at retirement so that you know what you need to do now to meet your retirement goals in the future. Once you know the formula, look at one of the retirement calculators on the Internet that you can input the information for an estimate of monthly retirement benefits you will receive. Some employers also may have access to an online calculator through their retirement plan companies. To defer or not to defer? Deferred compensation plans let employees set aside part of their annual salary to be paid at some point in the future, presumably retirement, when your tax situation may be different than it is today. Money grows tax deferred until paid out to the employee. There are no required minimum distributions. The maximum contribution for 2018 is $18,500. Employees age 50 or older may contribute up to an additional $6,000 for a total of $24,500. Because the purpose of deferred compensation plans is to save for retirement, early withdrawals are strongly discouraged. There is a 10 percent IRS penalty for withdrawals before the age of 59 ½. My transcript income will not be included in my employee retirement benefits. Deferred compensation is a great way to supplement your retirement income to cover the loss of transcript income. Take advantage of deferred compensation on Day 1. At the young age of 30 — it seems like it was young now, but in the grand scheme of retirement savings, it was years too late — I began taking advantage of deferred compensation. I started out small. For every $100 taken out of my paycheck, it earned back approximately $60 due to the tax savings. I did something right when I slowly began increasing it over the years in small increments; I hardly noticed the difference in my paycheck. Still, I sometimes imagine how much larger my account would now be if I had started on Day 1. If you have a flexible health plan through your employment, use it. Many courts offer a pre-tax Flexible Spending Account (FSA) or a Health Savings Account (HSA) plans to pay for copayments, deductibles, some prescription drugs, and some other health care costs. If you have the option, I’d suggest taking advantage of this system. It reduces your taxes because, when you set aside money in an FSA or HSA, you don’t pay taxes on this money and you can use it to pay for some health needs. Additionally, contributing to an FSA or HSA frees up additional money that would have been paid to taxes that you could use to increase your funding for Deferred Compensation plans your employer may offer. Maximize years of service credit. The first three years of my court employment, I was employed as a per diem reporter. I did not have access to the retirement benefits offered to full-time employees. I was able to purchase those three years of service credit to increase my years of service for retirement calculations. Seek professional advice to see if this is an option that is worth exploring. Deferred compensation funds may be allowed for purchase of service credit. Lesia Mervin, FAPR, RMR, CRR, CRC, is an official reporter and freelance CART captioner based in Visalia, Calif. She can be reached at realtimecsr@comcast.net. This article should not be relied on as financial advice specific to your situation. As always, NCRA encourages individuals to reach out to a trusted CPA or other financial advisor to review your personal situation. Exiting your business is a hot topic for many owners that seems fairly simple at first glance. You start your firm, let it grow for 25 or 35 years, and then sell it to someone while you quietly walk into the sunset with a pocket full of cash. But the reality is more complicated. When you started your firm, it was unlikely you were thinking about what you needed to do to sell in the future. And you might have assumed that there would just be someone to buy your firm at your price when you were ready to sell. That’s not always the case. Let’s run through some of the things that you, as a court reporting firm owner, can do to make the whole process smoother. The first question that we may ask is: How soon are you planning to leave your business? If you want out today and you started thinking about an exit last week, this is a different scenario than if you have been planning and engineering your firm for exit years in advance. Most of the time, owners have not planned ahead for the best possible exit. 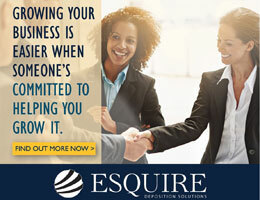 What is my firm actually worth to an outside entity? How would a deal be structured if I were to sell? Is the buying firm a cultural fit with my existing firm? What will happen to my staff and reporters? Will my clients be treated in the same way that I have treated them through the years? You may have even more questions, but let’s start with these. Unfortunately, it might not be as much as you think. Most owners want to be compensated for the years spent building their firms. Instead, the market is concerned with evaluating a firm’s value, usually using something called the EBITDA (earnings before interest, tax, depreciation, and amortization). An interested buyer will probably offer a multiple of that number to come up with a value that he/she is comfortable with. Both parties should consider many factors when coming up with a deal. The structure of one deal can be different from the next. There isn’t a standard deal structure. If you are offered $1,000,000 for your firm, that $1,000,000 can be paid out in many different ways over a period of time. It may be in an upfront payment, or a smaller portion may be given at the beginning with the remainder being paid out over a period of time (for example, three to five years) to the owner. There may also be certain levels of revenue and earnings that are a part of the deal that could affect an owner’s payout over time. The main point here is that deals are created differently and structured differently based on an acquiring firm’s goals and directives. This is a valid question and concern for any owner. It’s important that the firm being acquired and the firm acquiring it are a good cultural fit; that is, they should have similar values. It’s to the benefit of both firms to explore this issue thoroughly. A transition to new ownership should be as seamless as possible — to benefit the staff, reporters, and clients. Many deals have gone off the rail because there wasn’t a cultural fit and similar mindsets moving forward. This is one of the reasons due diligence on both sides is very important to the acquisition or merger being a success. The financial aspect is extremely important, but the cultures should mesh as well and not be overlooked. Again, this is a valid concern for an owner. You have built your staff and reporters over many years, and they have become part of your family. Most firms are respectful of current staff and reporters and are not interested in anything that would be disruptive to any potential acquisition of your firm. Your staff and reporters have helped build the firm to the point where an outside entity would be interested in acquiring your firm. It would not be to the acquiring firm’s advantage to make wholesale changes to the very people who contributed to the success of the firm. Having said that, other factors could affect the acquisition downstream. The clients are always a concern on both sides of an acquisition. They are the lifeblood of the industry. That’s one of the main reasons that the cultural fit is so important to ensure clients remain. An acquiring firm is taking risks because there is no guarantee that clients will continue to be clients. As owners, all of you take the same risk with clients every day. The client who is with you today is not guaranteed to be your client next month. Everyone in the industry understands the value of protecting the client base. This is an additional reason that due diligence is so very important in any exit strategy. Many of the potential negative issues can be avoided at the beginning instead of putting out fires at the end. What we have tried to illustrate is that there is not a “one size fits all” type of deal. There are many different factors in many different areas to consider before you exit. Educate yourself as much as possible to ensure you understand the process and the components of the process before you move too far down the exit pathway. Many owners are not prepared for all of the ramifications and, therefore, not ready to exit. If you are thinking about an exit, make sure you go into any potential situation as an informed and educated owner with the right questions. Terry McGill is a small business consultant and managing partner of Strategic Business Directs. He assists court reporting firm owners with operational, financial, organizational, growth, marketing, sales, and exiting issues. He can be reached at terry@strategicbusinessdirects.com or 614-284-0846. The last chance to register for the 2017 NCRA Firm Owners Executive Conference is Feb. 3. The conference promises attendees the perfect networking and getaway opportunity filled with educational sessions, social events, and outings sprinkled with fun and relaxation. The event is being held Feb. 12-14 in Tucson, Ariz., at the Lowes Ventana Canyon Resort. Attendees can also make the most of the conference experience by downloading the NCRA event app for Apple and Android devices to put event planning, learning, and social networking at their fingertips for all NCRA events. The app allows users to receive up-to-the-minute event updates, customize their schedules, access session documents, view speaker and exhibitor profiles, connect with other attendees, and more. Keynote speaker Susan Solovic will take center stage and share with attendees her insights and secrets to becoming a successful entrepreneur. Solovic is an Internet pioneer who cofounded and grew one of the first video-based Internet sites to a million-dollar-plus entity. She is also an award-winning serial entrepreneur and best-selling author. Her experience also includes being a former small business contributor for ABC News and hosting the syndicated radio program It’s Your Biz. She appears regularly as a small business expert on Fox Business, Fox News, the Wall Street Journal’s “Lunch Break,” MSNBC, CNN, CNBC, and other stations across the country. She has also hosted her own PBS special called Reinvent Yourself Now: Become Self-Reliant in an Unpredictable World. Solovic is also a featured blogger on numerous sites, including Constant Contact, Entrepreneur, AT&T Business Circle, FoxBusiness.com, MasterCard, Intuit, The Pulse of IT (HP), and Samsung. Learn more about Solovic’s presentation. Laurie Forster, one of America’s leading wine experts and author of the award-winning book The Sipping Point: A Crash Course in Wine,will host a special fun-filled networking session. Forster has been featured in dozens of publications and has appeared on Oz., Fox Business, ABC News, and other outlets. She also hosts her own show called The Sipping Point, where she explores recipes, wines, food, travel, and more. Attendees at this session will enjoy teaming up to identify wine selections and then battle to see who can really Name that Wine. Mike Nelson, NCRA CEO and Executive Director, will present the findings from NCRA’s 2016 Firm Owners Economic Benchmarking Survey. “Mobilizing Your Dreams: A 21st Century Strategic Plan,” an interactive session that The Varallo Group will present, is designed to teach attendees how to establish a long-term vision for their firm and more. The Varallo Group will also present “Journey to the Center of a Client Decision,” which explores the court reporter–hiring decision process. NCRA President Tiva Wood, RDR, CMRS; President-Elect Chris Willette, RDR, CRR, CRC; and fellow firm owners will also lead teams on a poker-run nature-hike networking event. Attendees will enjoy a special Valentine’s Day comedy night and closing reception. Only attendees of the Firm Owners Executive Conference can take advantage of the special resort room rates, which have now been extended to Feb. 11. Multiple registration discounts are also available as long as they are accompanied by one full-priced registration. These discounts include all education sessions, networking events, and access to the exhibit area. Make this event even better when you arrive early or extend your stay, and take advantage of special room rates that apply three days prior to and three days after the conference, negotiated for attendees by NCRA. Attendees can also take advantage of an array of amenities, including waived resort fees on self and valet parking, fitness center access, yoga classes, and tennis court rentals. Other amenities include a free shuttle service to beautiful Sabino Canyon, discounts on golfing, spa facilities, and more. In addition to networking opportunities, award-winning speakers and authors, cutting-edge educational content, and vendor speed dating, the schedule includes more free time in the afternoons for attendees to network with each other on their own. For more information or to register for NCRA’s most elite event of the year, visit NCRA.org/FirmOwners. As entrepreneurs close one year, many use the opportunity to set themselves up for success in the following year. One way to do this is to start looking at maximizing tax opportunities at the end of the year. Some of the top tax write-offs for self-employed people and business owners, according to TurboTax, are IRAs, home-office use, and educational expenses. Work-related memberships, such as to a state or national organization, are also common write-offs for many entrepreneurs. “I get my court reporting machine serviced before the end of the year, and as a company, we pay our tax bill before the year turns, top off our office supplies, and reorder tchotchkes in our marketing closet,” says Debbie Dusseljee, RPR, CRC, reporter and owner of CompuScripts, located in Columbia, S.C.
Schmitt mentioned that her company picks out a different charitable group each year. Michael Pace, CEO and president of Argen Blando Court Reporting & Video in Denver, Colo., mentioned that his company plans to give to both Justice and Mercy Legal Aid Clinic and Dolls for Daughters this year. Many charitable contributions can qualify as tax deductions against a business’s annual tax liability. Pace suggested an article on charitable contributions from the Small Business Administration for those considering making donations. Since each person’s personal and business situation is unique, it’s important to remember to assess the each individual’s personal situation. Be sure to start making plans now to be a part of NCRA’s major 2017 events, the Firm Owners Executive Conference, Feb. 12-14, and the Convention & Expo, Aug. 10-13, each promising to offer attendees sessions on the latest trends in the profession laced with an array of exclusive networking opportunities. NCRA’s 2017 Firm Owners Executive Conference is being held at the beautiful Loews Ventana Canyon Resort, Tucson, Ariz., a top choice among Arizona luxury resorts nestled in the stunning Catalina Mountain range. Watch for information about registration and hotel rates coming later this month. According to Cregg Seymour, owner of CRC Salomon, with headquarters in Baltimore, Md., and chair of NCRA’s Education Content Committee for the Firm Owners, there are four reasons to attend the Firm Owners Executive Conference. Networking with other firm owners: Attending this event helps build, solidify, and strengthen relationships at the personal level and also allows for the sharing of ideas, marketing, trends, and best practices in the marketplace. According to Seymour, the people you meet and the experiences you share create a return on investment of time and money you spend attending the conference. Educational opportunities: No matter how experienced a person is in their field, firm owners should seek to expose themselves to the educational opportunities that suggest new ways of conducting business, new technology, and ways to be more productive, says Seymour. It can also help breath life back into the critical aspects of business or reignite ideas that you may have recently put on hold or been too busy to think about. New vendors: Exposure to new vendors in court reporting who have created innovative products and services that will help firm owners stay competitive in today’s fast-paced world. It’s important to invest the time and get to know the sponsors and vendors who understand the industry at the national and global level. If their solution works well for your business now or in the near future, they can be great allies. Fun: The goal is to have fun! The conference allows one to get out of the office, learn something new, meet interesting people, and have fun while sharing experiences with other leaders in court reporting. Reconnect with old friends and make new ones at the conference events and parties while also taking advantage of the resort, local restaurants, and outdoor activities. NCRA’s 2017 Convention & Expo being held at the Planet Hollywood Resort & Casino, in Las Vegas, Nev., will be site of the largest gathering of court reporters, captioners, legal videographers, and others in the legal services, with a program menu bursting with new and exciting session content and networking opportunities. Watch for more information about registration and hotel rates in upcoming issues of the JCR and the JCR Weekly. For any court reporter, starting up a firm can end up being more than a full-time job. In addition to actually recruiting clients and scheduling and handling what hopefully is a steady stream of depositions and transcripts, there’s also the daunting tasks of marketing your business, hiring staff if needed, lining up freelancers willing to step up and take overflow work in a pinch, and in general making sure the checks are coming in and expenses are getting paid. It’s no wonder many end up putting off the big step of formally incorporating their business for as long as possible. But any accountant or financial planner worth his or her salt will recommend that decision be made sooner rather than later — and how that’s done can have huge repercussions not only on the reporter’s tax bill, but also how well-positioned the firm in the future for a possible merger or sale in the future. In general, the consensus seems to be that once a reporter begins generating more than part-time cash flow, they need to start thinking about incorporating — and that decision usually comes down to a choice between either an S-Corporation or an LLC (Limited Liability Corporation). Luck, who works at CLS Financial Advisors, adds that even freelance court reporters could benefit from incorporating, though she tends to recommend an LLC for those individuals. Matthew Alley, who along with his wife, Tiffany, co-founded Atlanta-based Tiffany Alley Global Reporting and Video, has experience with both LLCs and S-Corps and suggests from his experience, most court reporting firms of any size will tend to do better as S-Corps. There are other factors that also need to be considered, Jensen says, adding her accountant pointed out that if there’s real estate involved, or if there’s foreign ownership, then an LLC is probably the best option. Incorporating a small business, especially a court reporting firm, is generally done for tax and possible liability issues, but it can also with it other advantages, including the ability to better organize what can be a complex flow of receipts and payments. Hinxman adds her accountant also alerted her to the tax advantages when she purchased a new SUV for business-related travel. When it comes to state taxes, the laws can vary, making it important for firm owners with clients in multiple states to understand the tax implications and complexities of each place they work in, which once drives home the importance of finding the right accountant for your business. But an accountant can only do so much, and Liberatore says the mistake he sees most from court reporters isn’t so much whether or not they’ve incorporated, but rather a lack of financial planning. As daunting as all that can be, especially when they’re also focused on running their day-to-day business, firm owners and reporters do need to work regularly with their accountant and financial advisor to plan for their long-term future. That could involve the eventual sale or merger of their business, but at the very least should include some pathway to a comfortable retirement. Alley say he and his wife, Tiffany, began preparing their firm for sale six years before it actually occurred, adding that included not only making sure the books were in order and taxes up to date, but also that an experienced management team was in place to help the new owners. Even if you plan on keeping your business for your entire career, Luck stresses that every small business owner needs a financial plan for the long term. 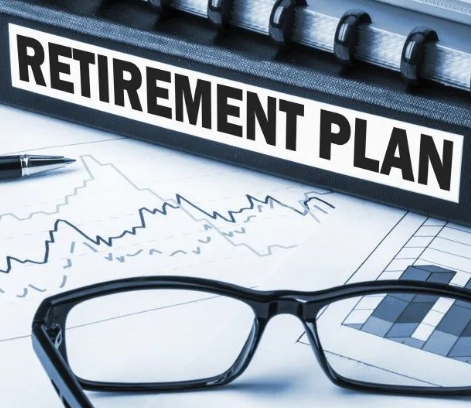 “Planning for a retirement plan of some sort, figuring out how much to save both for income tax savings provided by a retirement contribution and for the future before all the money is spent –and developing lifelong good saving habits — will greatly benefit a new business owner,” she said. One way to do that is to meet with your accountant every autumn, well before the beginning of tax season, to work on year-end planning. David Ward is a journalist in Carrboro, N.C. Comments on this article can be sent tojcrfeedback@ncra.org. Huseby, a court reporting firm based in Charlotte, N.C., has instituted a program called Instant Pay for Reporters to instantly compensate court reporters, videographers, and trial technicians, according to a press release dated Oct. 31. An increasing number of NCRA members are signing up to earn hefty savings on office supplies and other items with Staples and significant savings on shipping costs through FedEx. The programs are available to members through a recently launched partnership between NCRA and Amplify. Participation in the programs requires no minimums and no contracts. NCRA worked with Amplify to develop the partnership programs specifically for members, recognizing that they spend a large portion of their budgets on office supplies and shipping fees. Through the partnership, members can save up to 40 percent on shipping and up to 72 percent on office supplies and other items. 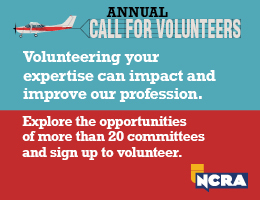 The programs are part of NCRA’s continued focus on delivering value to all members. Members simply need to sign up with Amplify to start receiving these savings. 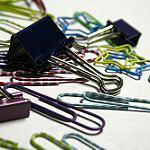 Find more information about the Staples program here and the FedEx program here. Not a member? Join now to take advantage of these members-only benefits. NCRA also offers members customized insurance plans administered by Mercer Affinity Group Services, a partner for 50 years. Plans include coverage ranging from accidental death and dismemberment to equipment insurance, as well as dental plans, pet insurance, and more. NCRA also offers a credit card affinity program through UMB Financial Corp. 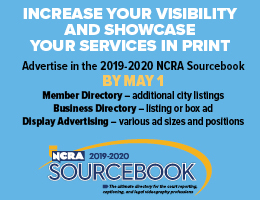 Learn more about all of the benefits NCRA membership has to offer by visiting NCRA.org. WCBI News 4 in Columbus, Miss., reported on Sept. 15 that the Lowndes County supervisors approved a pay increase for court reporters. The Lowndes County portion of that increase will equal about $17,000 a year.